The following blog post was originally published on CrainsDetroit.com and was written by Michele Economou Ureste for her guest blog on “Jobs & workplace” for Crain’s Detroit. Click here to view the original publication on CrainsDetroit.com. Workforce agencies recognize veterans as a highly attractive talent pool to help address a significant labor shortage. Nonetheless, according to the U.S. Department of Labor, there remain some misconceptions over hiring veterans upon return from military service. 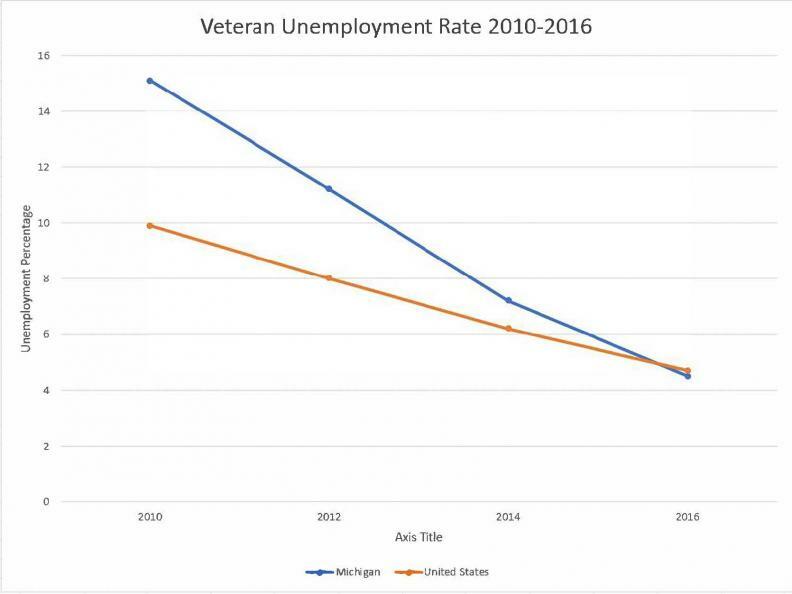 According to data from American Fact Finder, the unemployment rate for veterans and nonveterans in Michigan and the United States has drastically improved from 2010 to 2016. Unemployment rates for veterans in 2010 were as high as 15.1 percent and 9.9 percent in Michigan and the United States, respectively, and were just around 4.5 percent for both geographies for the most recent data year, 2016. Unemployment rates have improved more drastically for veterans in southeast Michigan than they have in the United States. In addition to Michigan Works! offices, there are several initiatives in Southeast Michigan and across the state that provide support to veterans, which have helped reduce effects of the stigma veterans often face in the workplace. The Michigan Veterans Affairs Agency has a Veterans-Friendly Employer Certification program that acknowledges Michigan employers committed to military veteran recruitment, training and retention practices. Top employers in the state include Consumers Energy Co., DTE Energy Co., Michigan Department of Transportation, Michigan State Police and Prestige Engineering, among many others. Many of these companies, according to Babcock, go above and beyond to hire veterans. Some businesses in Southeast Michigan are taking veterans employment issues a step further by making their organizations more veteran friendly and seeking to hire veterans, as this type of employee prospect fits their culture well. Tom Nichols, executive vice president of Prestige Group, a Gold-Level Veteran Friendly Employer under the Michigan Veterans Affairs Agency’s Veteran Friendly Employer program, is passionate about hiring veterans. Though veterans may face stigmas in their search for employment, the mindset seems to be changing, especially among employers as they search for new methods of acquiring talent. Numerous initiatives address these issues and actively improve the lives of veterans in Southeast Michigan. Many employers are not only veteran friendly, but actively seek to hire veterans, knowing and appreciating their value and commitment. The unemployment rate of veterans in Michigan has improved at a better rate than the rest of the nation in the last several years. While not a complete list of organizations, this list provides a snapshot of the many different types of organizations that offer a wide range of services for veterans. The work of these organizations and other partners supporting veteran employment in Michigan continues to benefit veterans and reduce the stigmas they often face in the workforce. For additional information on training and employment services available to veterans in Southeast Michigan, visit a Michigan Works! Service Center and ask to speak with a veterans career specialist. To find a service center in your area, visit MichiganWorks.org or call 800-285-WORKS (9675). — Michele Economou Ureste is the executive director of the Workforce Intelligence Network for Southeast Michigan. Research and writing for this blog post was a collaborative effort between Ureste and Danielle Bowman, project manager at WIN.